Custom Hearing Aids – Horizon Audiology, Inc. Traditionally, hearing aids are known as bulky, conspicuous gadgets that prioritize function over form. While it’s important to put your hearing first, custom hearing aids allow you to hear better and choose a more discreet apparatus that’s comfortable for extended wear. At Horizon Audiology, Inc., we help our patients discover the custom-fitted hearing aid that’s right for them. The first step in choosing a hearing aid is to assess the strengths and limitations of your hearing. 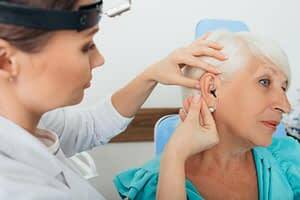 Our audiologist will conduct a thorough exam, discuss the results with you and your loved ones and then ask a series of questions designed to help us understand your daily routine. We offer many types of hearing aids, each with its own list of pros and cons. Is a behind-the-ear device more comfortable for you? Would you prefer an invisible in-the-canal model? Will you be using your device to listen to daily lectures or while traveling? The better we get to know you and your needs, the more effective your device will ultimately be. Your ear shape is like a fingerprint — it’s distinct and unique to you. No one else in the world has ears quite like yours, which makes one-size-fits-all hearing aids less than ideal. We take use ear molds to create a hearing aid shell that fits your anatomy precisely, then add all the right components. Thanks to that custom fit, in-canal hearing aids sit more deeply and have less distance over which to transfer sound waves. The result is a hearing aid that’s more comfortable as well as more effective, delivering impressive sound that’s higher in quality rather than just higher in volume. While the accessibility and affordability of OTC hearing aids may make them an attractive option, it’s essential you visit a qualified healthcare professional to evaluate your hearing in person. Even if you’ve had an exam in the past, your hearing needs may have changed, and OTC products rarely offer the same customization and technological innovations as custom-fit hearing aids. Horizon Audiology, Inc., offers several options for custom-fit hearing aids. For an expert evaluation of your hearing or to get fitted for a hearing aid — including the revolutionary new Lyric by Phonak, the only 100 percent invisible extended-wear hearing solution — call our office at (609) 448-9730 or contact us online today. LIFE IS CALLING. HORIZON HELPS YOU ANSWER. Copyright © 2019 Horizon Audiology, Inc.. All rights reserved.